Flattened tuber, with one or many leaves; stem with leaves, carrying bulbils; spadix with an appendix; inflorescences appearing with the leaves; terrestrial or epiphytes. Tuber globose, flattened, 2-3 cm in diameter and 1.5-2 cm thick. Cataphylls 8-15 cm long; stem erect, brown-reddish 15-25 x 5mm, bearing bulbils on the upper half; LEAVES: 1 (-3) leaves; petiole cylindric, 20-50 cm long. Bulbils 6-9 x 3-4 mm. Leaf blade peltate, ovate (insertion of petiole in the lower 1/3) cordate at the base, cuspidate at the apex, 20-40 x 13-25 cm, dark green on the top; primary veins and the midrib very pale, sometimes slightly green-brownish at the start of the veins; 4-7 primary lateral veins each side, forming an angle of 45º with the midrib; posterior lobes up to half the length of the anterior lobes, joined for ca. 3/4 of their length; Sinus rounded at the base. INFLORESCENCE: Peduncle 10-15 cm long. 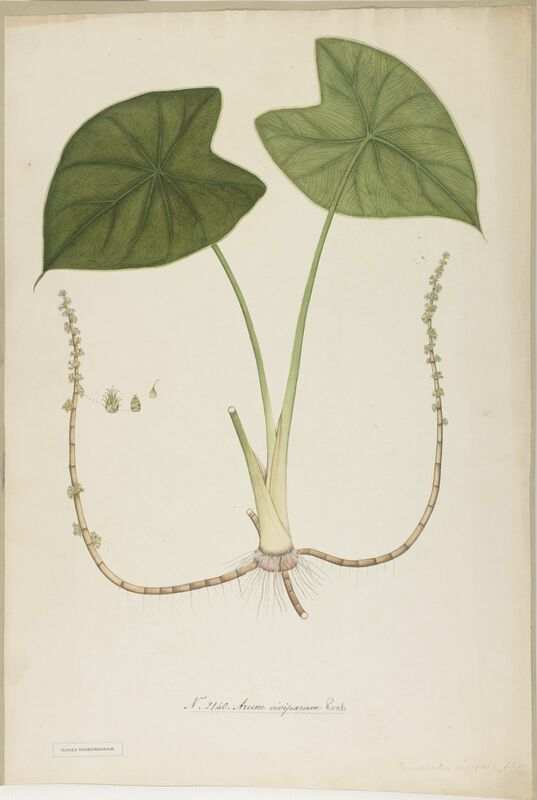 Spathe 9.5-13.5 cm long; exterior of tube green, much paler inside, 3.5-4.5 x 1 cm diameter; blade yellow, 6-9 cm long, upper 1/3 the same width, with a point 3-5 mm long; spathe limb reflects during anthesis. Female zone of spadix ca. 2 cm long; fertile male zone elliptic, 1.5 cm long, a little shorter, but thicker than, the sterile zone; spadix without appendix. Synandrodium clavate, with 2-3 stamens; thecae elongate, dehiscing via an apical pore. Synandrodium flattened. Ovary obovoid, 1 or 2-4 incomplete locules; ovules numerous, hemiorthotropous; placentation parietal; stigma sessile, discoid. INFRUCTESCENCE: Berries obovoid, globose, enclosed by the spathe; seeds numerous, elliptic. Chromosomes 2n=56 Tuber depressed globose, 2–4 × 3.5–5cm; stolons erect, simple, stout; bulbils ellipsoid, 0.5–2.5mm, stout; bristles to 1.5mm, stout. Cataphylls 4 or more, brownish, broad, concealing peduncle, ca. 15 × 3cm. 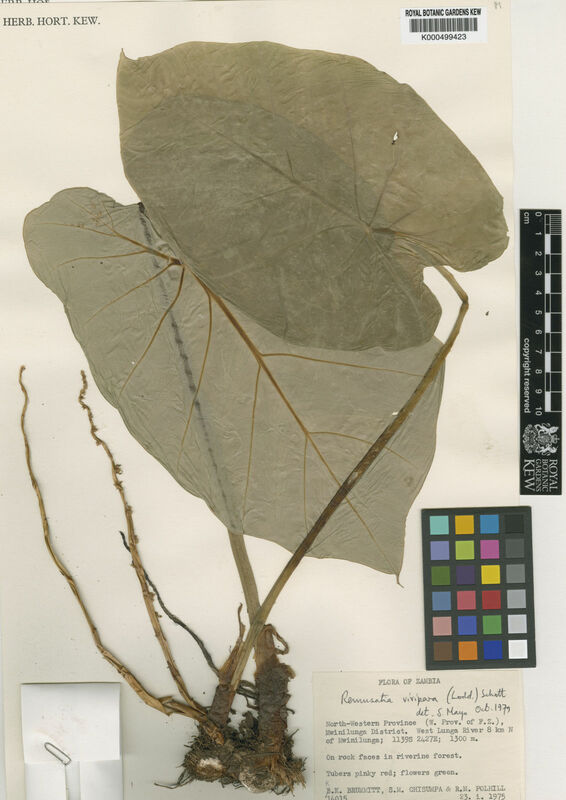 Petiole 19–42cm, proximal 1/4 sheathing; leaf blade glossy on both sides, pale green abaxially, green adaxially, oblong-ovate or lanceolate, 11–33 × 7–19.5cm, sinus 1.5–3cm; intramarginal vein indistinct. Flowering before leaves develop. Peduncle 6–12cm. Spathe tube green outside, 3–5 × 1.3–2cm; limb initially erect, later reflexed, yellow inside, obovate, 5.3–11.5 × 2.5–9cm, narrowed to base, apex acute, apiculate. Spadix: female zone 1.7–2cm × 7–9mm, with 3 or 4 whorls of sterile ovaries at apex and 1 or 2 whorls at base; sterile zone 1.1–2.5cm, slender, tapering distally; male zone yellowish, clavate, cylindric, 1.5–2.2cm × 4–7mm. 2n = 28, 42. Subtropical forests, epiphytic, on rocks, cliff ledges. Growing in the humic soil in forests, found in collections of humus on limestone. (Ankarana massif) or gneiss or as an epiphyte, sometimes among Asplenium nidus and or Orchids. The bulbils cling with their bracts hooked in the fur or in the plumage of the animals which ensure in this way dispersal of the species. Seasonally dormant, rupicolous or epiphytic herb. Tuber subglobose, 2–4 cm. in diameter, covered in brown fibrous cataphyll remnants. Bulbils ovoid, 0.4–0.5 cm. long, green, covered in numerous tightly-overlapping glume-like scales with aristate recurved tips, borne in clusters at nodes of several erect aerial copper-coloured sympodial axes, each about 20 cm. long, arising from tuber and bearing small brown scale leaves. Leaves 1–2, often solitary, petiole green, terete, 30–40 cm. long; blade broadly peltate, ovate-cordate, 20–30 cm. long, 14–19 cm. broad, or larger, bright green, acute-acuminate, base with parabolic sinus ± 3 cm. long. Inflorescence rarely seen, subtended by several broadly oblong cataphylls. Spathe 7–11 cm. long; tube ovoid, 2–3 cm. long, green, strongly constricted at apex; limb subcircular to broadly spathulate, 6–8 cm. long, 5–6.5 cm. broad, creamy yellow, reflexed at maturity. Spadix 3–4.5 cm. long; staminate part clavate, creamy white, 0.7–1.3 cm. long, 0.5 cm. in diameter; intermediate sterile part conic, ± 1.1 cm. long, 0.2 cm. in diameter; pistillate part subcylindric, green, ± 1.8 cm. long, 0.8 cm. in diameter. Bulbiliferous shoot leafless and brown. The tubers are poisonous. They are used externally to treat mastitis, traumatic injuries, abscesses, and swellings. Aké Assi, Contrib. 2: 21 . Nicolson in Fl. Hassan Distr. : 788, t. 13, fig. 117 (1976). Bogner in Fl. Madag. 31: 28 (1975). Hepper in Flora of West Tropical Africa, ed. 2, 3: 122 (1968). Robyns in Ann. Soc. Sci. Brux., sér. B, 51: 222 (1931). Krause in A. Engler, Das Pflanzenreich 71 (IV. 23E): 16, fig. 4A–M (1920). Engl. in Notizblatt des Botanischen Gartens und Museums zu Berlin-Dahelm 5: 300 (1913). Schott in Schott & Endl., Melet. Bot. : 18 (1832).